Use of this site is limited to personal, non-commercial and the content contained herein may not be copied, modified, duplicated or distributed in any form or for any reason without the express written assent of Doxa. All content included on this site, including without limitation, text, graphics, images, animations, computer programs, data, designs, logos, button icons, arrangement and collection, is the property of Doxa. Doxa does not use any active system (spyware) to obtain information from website users. All information obtained by Doxa passively from users of its website is subject to privacy and will not be provided to third parties, with the exception of law enforcement officials. Doxa reserves the right to keep limited records of information on website users for security, statistical or its own promotional purposes. Doxa excludes any responsibility for contents of third party websites made accessible through links on the Doxa website. Such links are only installed by Doxa for informational purposes and are used at the user’s own responsibility. 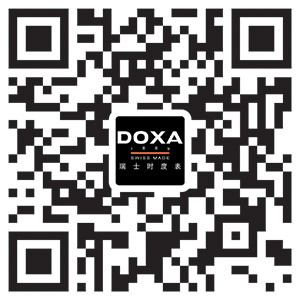 Doxa Watch Co. Ltd., all rights reserved.